Pineapple is both delicious and nutritious. But did you know that they are also fairly high in sugar? Because of this, if you have diabetes or follow a low-carb diet, it's best to manage your pineapple portions carefully. For most consumers, the fruit can be a smart addition to your diet. Most of the calories in pineapple come from carbohydrate. A cup of chunks contains 82 calories and almost 22 grams of carbs. Most of the carbohydrate is sugar. There are over 16 grams of naturally-occurring sugar (fructose) in a single serving of pineapple. You'll also gain over two grams of fiber. The glycemic load of a cup of pineapple chunks is estimated to be 6. There is almost no fat in pineapple. A serving provides less than a single gram of fat. Pineapple is not a good source of protein, providing less than one gram per serving. Pineapples are an excellent source of vitamin C, containing more than one day's worth in a one cup serving. They also contain manganese and are a good source of thiamin. Thiamin is a water-soluble B-vitamin that is involved in metabolic processes, including carbohydrate and protein digestion. Pineapples have some rather interesting health benefits thanks to the nutrients found in the fruit. A study published in 2000 examined thiamin in 2,900 Australian men and women over the age of 49. It concluded that those who had the highest thiamin intake were 40 percent less likely to have nuclear cataracts than those in the lowest fifth of the study. A 2005 study of 408 American women backed up these findings. Pineapple is also known to contain the anti-inflammatory substance bromelain. This mix of enzymes is thought to be most effective in inflammatory conditions such as arthritis, sinusitis, and even muscle strains, sprains, and other injuries. Bromelain is said to aid digestion as well. Early evidence indicates it may be useful in cancer treatments, though more research is necessary. However, researchers note that the amount of bromelain found in pineapple is not enough to act as a medicine. Bromelain supplements and topical treatments are available for this purpose. However, there are side effects, drug interactions, and precautions for certain medical conditions. Talk to your doctor before using pineapple or bromelain for medicinal purposes. The vast majority of pineapples come from Hawaii. 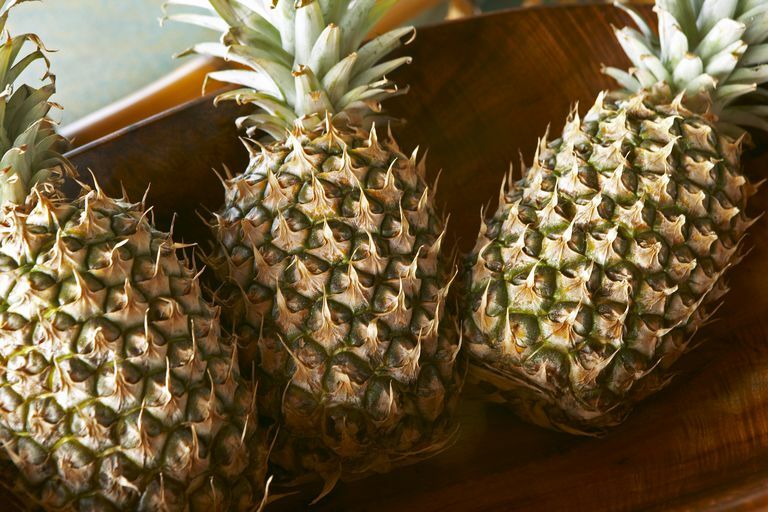 You can expect to find fresh pineapple year-round, though the peak season is from March through June. Is canned pineapple as healthy as fresh pineapple? Canned pineapple can be rich in sugar. Before eating it, be sure to drain the liquid and rinse the fruit. That juice or syrup can add anywhere from 5 to 15 grams of sugar (roughly one to four teaspoons). A better choice is to look for canned pineapple with no sugar. Should you avoid pineapple if you are on a low-carb diet? Pineapple is relatively low in calories, but a lot of those calories come from carbohydrates. Depending on how you slice it, the thickness and width can change the amount of carbohydrate you're taking in. It also makes it easy to overeat. It's best to stick with just 1/2 to 3/4 cup serving of pineapple chunks. Also, try to eat this fruit with a meal or a protein-rich food such as low-fat Greek yogurt or cottage cheese. Can pineapple speed up labor? Expecting mothers often hear that pineapple can speed up labor. It is thought that the enzyme bromelain can soften the cervix. However, there is very little hard scientific evidence relating to the effectiveness of this. In fact, a critical study of various complementary therapies during childbirth notes that the amount of bromelain in pineapple is insignificant. You'd have to eat a lot of the fruit to possibly induce labor. Pineapples spoil very easily. It is important to use the fruit shortly after buying it and be careful in your selection process. Select fruit that is heavy for the size, this means it will be nice and juicy. It should have a strong, sweet aroma and a rich color. Avoid pineapple that smells fermented or sour. Skip fruit that has dried leaves, bruises, darkened areas, or soft spots. As an alternative, you can purchase canned pineapple as slices or cubes. It can also be found crushed, dried, or candied. Try to choose pineapple that does not have sugar added. Be sure to read labels to help with portion control. Pineapples can be an intimidating fruit to cut, but once you get the hang of it, it shouldn't be a problem. Slice off the leaves and stem. Stand the fruit upright and cut off the peel in vertical strips. Cut the fruit away from the woody core—this is typically done in quarters. Cut the flesh of the fruit as desired. It really is amazing all the ways you can enjoy pineapple as a snack or for breakfast, lunch, or dinner. Pineapples are excellent when eaten raw and make an excellent addition to salads. You can also cut the fruit up and add it to low-fat yogurt, cottage or ricotta cheese, or use it in a favorite smoothie recipe. Pineapples can also be baked, grilled, or incorporated into various soups and stews. If you are allergic to a variety of fruit, you may also experience a reaction when consuming pineapple as cross-reactivity in fruit allergies are possible, according to medical experts. Additionally, the bromelain in pineapple may not be safe for people taking certain medications. According to the Memorial Sloan Kettering Cancer Center, you should speak to your healthcare provider before consuming pineapple if you are on a blood thinner (such as Warfarin) or if you take a tetracycline antibiotic. Higdon J, et al. Thiamin. Micronutrient Information Center, Oregon State University. 2013. Ehlrich SD. Bromelain. University of Maryland Medical Center. 2014. Evnas M. Postdates Pregnancy and Complementary Therapies. Complementary Therapies in Clinical Practice. 2009;15(4):220-224.